Depression affects at least 6 million Americans over 65, yet it is often difficult to diagnose due to the similarity between symptoms of depression and symptoms of the various medical conditions associated with aging. The elderly may also be likely to assume that their depression symptoms are merely normal signs of aging. Older adults are twice as likely to commit suicide as a result of their depression than people in other age brackets. As much as a fifth of the American population over the age of 65 suffers from depression, including a 30-40% depression rate in retirement communities and nursing homes. Several factors increase the likelihood of an elderly person becoming depressed, many of them having to do with pain and loss. Health problems that cause chronic pain or are treated with medicines that have negative side effects can lead to depression in the elderly. Loneliness and isolation caused by the death of loved ones and living alone can cause depression. Loss of personal direction or goals as a result of retirement or mobility can make the elderly depressed. Fears about death, the afterlife, financial instability, and decreasing health can lead to depression.Loss of loved ones such as spouses, children, pets, and friends can cause depression. Sleep disturbance and fatigue can be signs of depression in the elderly. Elderly depressed people may lose interest in activities that they used to enjoy such as hobbies, pastimes, and spending time with friends. Loss of endurance, weight, and appetite are potential signs of depression. Feelings of sadness, worthlessness, and self-loathing are indications of depression. Fixation on or conversations about death, dying, and suicide are red flags. One of the main differences between depression in younger adults and older adults – and perhaps one of the most surprising – is the fact that a number of seniors who are depressed report that they don’t feel sad. One aspect of depression that differs most significantly between older adults and younger ones is the ability of drugs and diseases to mask or explain away the symptoms of depression in the elderly. For example, an elderly person may find it difficult to distinguish between clinical depression and grieving for a lost spouse. Is Grandma depressed or does she have thyroid problems? While young people can certainly experience these problems as well, most young people do not yet have to contend with these issues. The average young person also does not take much medication and thus does not have to wonder about whether their pharmaceutical cocktail is depressing them or if they have clinical depression. Another difference is that depression also often lasts longer in the elderly than in the young and more often leads to suicide, particularly between the ages of 80-84. Conversations about death and suicide as well as overt suicide threats are definite warning signs of suicide in the elderly. Drinking more alcohol or taking more prescription drugs can be signs of impending suicide. Rewriting a will or saying elaborate goodbyes to loved ones can be indicators of suicide. A sudden interest in firearms and stockpiling medications can be signs of suicide. Social withdrawal and failure to take care of oneself are potential suicidal signs. Geriatric women are twice as likely to become depressed than elderly men. When senior women do become depressed the depression is likely to last longer than it does in men. Some experts believe that the reasons for the difference between depression in older men and women is due to hormonal factors while others believe that women are more likely to become depressed as a result of physical disability or recovery from a medical condition such as a broken hip, side effects from prescription medications, grief over the loss of a loved one, lack of social support network or a combination of these. Elderly women can benefit from seeking treatment for depression. Their quality of life can get better. The first step is seeking help from their doctor. Sometimes depression is misdiagnosed as dementia in some older adults so it’s important that family members especially ensure that an accurate diagnosis is made. One of the reasons these two conditions are confused is that there are many similarities between dementia and depression such as memory issues and concentration lapses. Also, a sufferer of either condition often experiences coordination issues and mental decline. Since these are often the symptoms commonly thought to be associated with dementia many people jump to the conclusion that if these symptoms are present and the person is older that the person has dementia. This is especially true since as we have seen some of the symptoms are so similar. It is important that the senior and his or her loved ones recognize the difference between the two. Seniors with depression may have memory and concentration lapses, but people with dementia suffer these constantly. Depression does not rob its victims of the abilities to know names, personal information, and location, but dementia often leads to confusion about personal identity and other such facts. While depressed elderly people may speak more slowly than is normal at times, people suffering from dementia often have trouble expressing themselves verbally. For example, when asking for a fork a person with certain types of dementia – not all – may call it something else entirely, like a tree. The depressed person can verbalize that the object is a fork. Often seniors with both dementia and depression have memory problems. The difference is that the depressed person notices the memory problems and will often worry if it’s a sign of ‘losing it’ while a person with dementia usually doesn’t realize that he can’t remember things. For instance, someone with depression may forget that they were told something but a person with dementia may ask 10 or more times the same question within the span of just a few minutes. People with dementia may forget how to do common activities such as how to dress or brush his or her teeth, but depression does not result in such a memory loss. The depressed person may forget if he brushed his teeth but knows how to brush them. Depressed people are often negative and pessimistic, but people with dementia may try to put a positive spin on a lapse in memory. 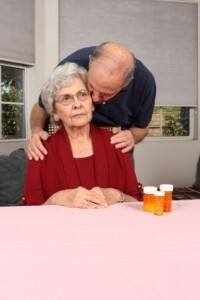 Since elderly adults are at risk for depression due to medicines commonly prescribed to them and grief due to loss of loved ones and the fact that often seniors with depression don’t feel sad it is critical that older adults and their loved ones get a professional diagnosis before jumping to a conclusion of dementia. While claiming that alcohol causes depression is inaccurate, overindulging in alcohol can lead to complications that cause depression. Alcohol slows down the central nervous system, ultimately leading to a decrease in serotonin levels and potential depression. Alcohol also impairs the mind’s ability to properly process emotions, feelings, and judgment, leading to a potential increase in sadness and anxiety. Some seniors try to use alcohol as an escape or a means of achieving better sleep, but it never serves well as either since the problems are still there when the person sobers and the alcohol itself disrupts sleep patterns. Alcohol can also lessen the effect of antidepressants, potentially causing the drugs the elderly are taking for their depression to at best be ineffective and at worst react negatively within the body. Certain medical conditions that are commonly associated with aging adults have been known to lead to depressive states. This is often a result of chronic pain, loss of ability associated with these conditions and/or the side effects of prescription drugs given for these conditions. Friends and family members of the depressed elderly might find assisting their afflicted loved ones to be intimidating and unsettling, but they can still help senior depression sufferers. One of the most important things a person can do to help a depressed elderly person is to take an active interest in his or her life. Listen to a depressed elderly person when they talk. Take him or her out somewhere with positive memories. Help prepare healthy meals with the depressed elderly person and make sure that he or she takes all proper medications; eating food with omega 3 fatty acids and tryptophan can help produce more serotonin and lessen the effects of depression. Show the elderly person that they are valued and respected and take all suicidal talk seriously. Antidepressants are a popular treatment method for the elderly, although doctors must be careful to not prescribe any pills that could interfere with a preexisting medication. Depression tends to last longer in elderly people than in other age groups, so the elderly will be on the antidepressants for longer. Psychotherapy can also help elderly sufferers of depression, especially those who do not wish to take drugs. Talking to friends, loved ones, or a therapist has been proven to be a helpful means of combating depression, so scheduling sessions with a therapist or joining a support group could be helpful. While some might be leery of the idea of electroconvulsive therapy, ECT has proven to be a good quick and temporary fix for relieving severely depressed and suicidal patients. During ECT, electrodes are applied to a patient’s scalp and a small electric shock causes a brief seizure in the brain. While this sounds dangerous, qualified physicians and technicians can conduct this treatment with little risk to the patient. If you or a family member shows symptoms of depression please contact your doctor to help determine the cause. Often it is due to prescription drugs or medical conditions in senior adults in addition to the more well known reason of loss of a loved one or a combination of all of these risk factors. 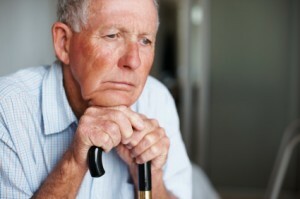 Depression in the elderly can be treated. It is important to get help before the condition grows worse as the risk factors of untreated depression can be quite severe.